Termites are a dread pest that can seriously damage your home. You may hear people complaining about the damage that termites can do to your home in just a few months, but termites will eat more than just the wood in your home. They will eat wood in your yard and the cellulose that is found in other plants around your yard. Will Termites Damage My Landscaping? Termites can damage your landscaping. Termites eat the dead cellulose in a tree. A living tree that is sick may end up with a termite infestation inside of it. This can be treated, but you will need to contact a tree doctor. The tree doctor can treat the tree to kill the termites and fill in the holds. They may also wrap the tree to prevent fungus and other insects from attacking it as it heals. Termites may damage things that you install around your yard as part of your overall landscaping. Playground equipment, fences, decking and outbuildings are all attractive to termites. If you use pressure treated wood, or wood that has been treated for termites then they will not bother it. Painting the wood can also be a deterrent. It is important to make sure that any wood that is under the ground is treated. What Are Signs of Termites in My Yard? You may see signs of termites around your yard. If you look at the foundation of your home, you may see mud tubes that go up from the dirt into the wood of your home. If you break these open, you will termites inside. If you see piles of discarded wings around your property this is another sign that termites may be on your property. You can set out termite monitoring stations that attract termites and allow you to see if there is any termite activity on your property. Most of the nests are not visible since they are primarily underground. How Can I Protect My Trees? A healthy tree will not be eaten by termites. If you take the steps to make sure that your trees are in good health, your trees will not have trouble with termites. This means you should regularly trim back dead branches. If you notice holes in your tree or it does not have as much foliage or any fungus growing on it, you should consult a tree doctor to see if there are any issues. Since trees are expensive and can take years to grow in order to provide shade for your home, it is important to work to protect your trees’ overall health. If there is an issue with termites or other woodboring insects or other infections, you may need to cut down the tree to save the other trees on your property. Are There Trees That Are More Resistant to Termites? There are certain trees that are naturally more resistant to termites. Cedar is naturally resistant to termites. Redwoods are another type of tree that is more resistant to termites. Cypress is another treat that is more resistant to termites. Mahogany and rosewood are also resistant. Birch, red gum, maple, pecan and pine trees are types of trees that attract termites more. Since termites eat dead wood planting these trees will not really make a difference in your yard when you are planning your landscaping. However, choosing termite resistant wood in your outdoor structures can protect your yard from termites. Can I Plan My Landscaping to Act as a Deterrent for Termites? There are things that you can do to protect your home and your yard from termites. As you plan your landscaping, you can keep these things in mind. It is important to keep up with the items in your yard. You should check these items on a regular basis and replace things or trim them back as needed. Protecting your yard from termites is an ongoing process that you will need to do the entire time you own your home. One is to make sure that tree limbs are not hanging over or touching your roof. This can give termites another access point to your home and may cause further difficulties. If the tree branches keep your roof damp, it may make it easier dampwood termites to set up a colony in your attic. Only use treated wood in all the structures that you use around your home, especially in anything that will be connected to your home like your deck. Your fence should also be made from treated wood. Be sure to stack firewood away from your home. Termites like dead wood and they find the wood in your woodpile and then move onto your home. Plant bushes at least three feet away from your home. Be sure to keep them trimmed back so that they do not touch your home. Check them periodically to make they are still heathy and remove and replace any that do not appear to be healthy. When you are considering mulch around the border of your home, some landscapers recommend not using mulch but instead recommend gravel. If you choose to have mulch be sure to choose cedar chips or pressure treated mulch. It is important to change it out at least every three years to make sure that the treatments are still effective. 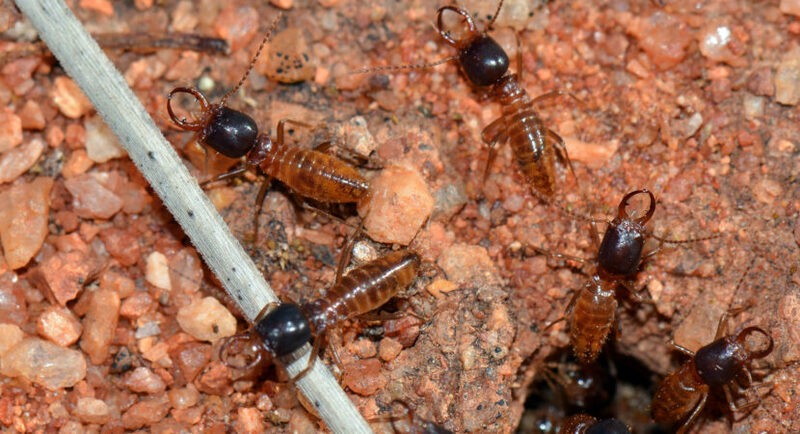 Are Organic Treatment Options Effective for Termites? While the idea of organic treatment options may be appealing, Texas A&M warns that the organic treatment options are not effective at stopping termites. There are barriers that you can install and you may be able to use sand layers as a way to deter termites, but if you have an active colony, you will need to use a conventional treatment to protect your home and yard from the termites. There are different treatment options depending on the types of termites. If your area is prone to subterranean termites the treatment will involve creating a barrier around the base of your home that should last up to ten years to keep termites out.